Spontaneous mutations act as engines to drive evolution; and lead to the development of antibiotic resistance by pathogenic bacteria and the initiation of human diseases. An important source of mutations corresponds to biosynthetic errors generated during replication of chromosomal DNA. Several factors contribute to replication fidelity, including nucleotide selectivity and exonucleolytic activity of DNA polymerases (Pol), and correction of misincorporated nucleotides that evade proofreading by mismatch repair (MMR) proteins. Fig. 1. Proposed model for the control of Pol IV-β clamp interaction by MutS. This model is based on previous studies of the Pol III /Pol IV switching (-A- and –B-), our results (-C-), and a postulated action of the ε exonuclease of Pol III in the excision of mismatches generated by Pol IV (-D-). Most of the β clamp-binding proteins interact with a hydrophobic cleft on the surface of the ring via a conserved binding motif (CBM). In addition, β clamp contains two binding sites given its dimeric structure. Pol III contains a high affinity CBM in the α polymerase and a weak CBM in the ε exonuclease. Pol IV and MutS have a single CBM per molecule. Each of the CBMs is shown as balls. Our model illustrates the action on a single primer terminus, and it does not depict other replisome components. Illustration created by Jeremías Di Pietro, Relaciones Institucionales, Centro Científico Tecnológico CONICET Córdoba. Genome duplication is mainly performed by high-fidelity replicative Pols, like bacterial Pol III, that function in the context of the multi-protein replisome machinery. Replisomes are likely to encounter lesions on the DNA template that generally inhibit synthesis by replicative Pols and block fork progression, leading to cell death. To rescue cells from damage-induced replication arrest, organisms possess specialized Pols, such as prokaryotic Pol IV, that efficiently insert nucleotides opposite DNA lesions in a process known as translesion synthesis (TLS). The conserved Y-family Pol IV catalyzes accurate TLS over N2-dG adducts and alkylation lesions and the error-prone bypass of oxidized bases, and it copies undamaged DNA with low fidelity. Pol IV may also relieve stalled replication forks on undamaged DNA by assisting Pol III during synthesis across difficult sequence contexts. Thus, although Pol IV promotes cell survival by allowing the release of replication blocks, its access to sites of DNA synthesis must be tightly controlled to prevent gratuitous mutagenesis. In this sense, the processivity β clamp has been proposed to play a central role in the regulation of Pol IV action since effective activity of this enzyme requires association with β clamp, which dictate their access to sites of DNA replication. We present for the first time evidence that the MMR protein MutS regulates the Pol IV access to replication sites by controlling its binding to β clamp (Margara LM., et al. Nucleic acids research. 2016). MutS recognizes and binds to mismatched bases, initiating the MMR process. Previous works have reported the interaction of bacterial MutS and eukaryotic MutSα with processivity factors, but a limited contribution of this interaction in the currently recognized functions of the MMR system has been shown. Our biochemical data demonstrated that MutS from Pseudomonas aeruginosa inhibits Pol IV-β clamp association by competing for the hydrophobic cleft of the processivity factor. 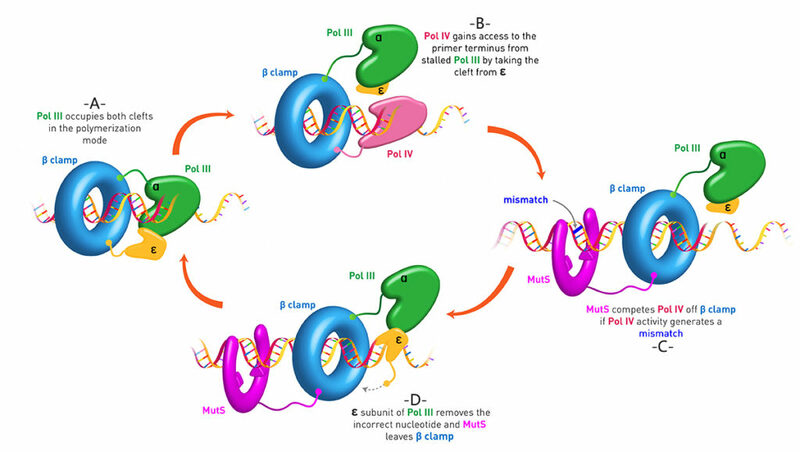 Moreover, the MutS-â clamp interaction limited Pol IV spontaneous mutagenesis resulting from the low fidelity replication of undamaged DNA under normal growth conditions, but it had no effect on accurate DNA synthesis catalyzed by Pol IV as in TLS of alkylating lesions. Conversely, Pol IV-dependent mutagenesis was not restricted by the MutS-â clamp interaction in P. aeruginosa cells under SOS conditions wherein the mutagenic activity of Pol IV is necessary to generate adaptive variants. Based on these results, and in accordance with previously published findings, we propose a mechanism for the control of Pol IV-β clamp interaction by MutS depicted in Figure 1. Our model predicts that Pol IV can effectively act to alleviate stalling of the replication fork, but if its activity generates a mismatch, MutS can limit further replication by Pol IV and impede the fixation of mutations. In conclusion, we describe a non-canonical function of MutS in the regulation of a replication activity in bacteria. Importantly, it has been previously reported that MutSá facilitates recruitment of TLS Pols in human cells in response to UV and oxidative damage. Hence, MutS plays a key role in the Regulation of Specialized DNA Polymerases Action (RSPA) in both bacteria and eukaryotes. MutS regulates access of the error-prone DNA polymerase Pol IV to replication sites: a novel mechanism for maintaining replication fidelity.